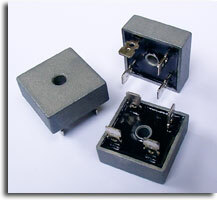 Wire, suitable enclosure, heat sinks for power N-fet, the actual dump load, etc. For TO-220 devices. Enough for the power N-fets that come in the kit if the load of each is 6 amps or less. 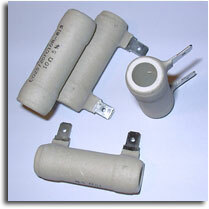 Each has a dab of heat sink compound for your convenience, plus, it will save you from having to buy a tube. 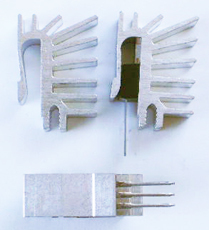 Heavy-duty clip-on aluminum heat sinks for TO-220 device (not included). Very limited quantities. 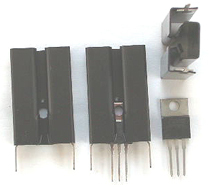 10A 60V TO-220 $1 each, or 6 for $5 They each require a separate heat sink. The cathode is connected to the tab. A collection of past their prime, though reasonably decent parts which I got/obtained cheap: A strange numbered 7809 voltage regulator rated for 1.5A in TO-220, two 1k trimmers, a few resistors, and a small piece of “perf board”. Not bad for the price! Hard to find, and generally quite expensive! These are for #8 wire; may require extra shipping charges. Golf cart batteries use 5/16” on both terminals. Marine batteries use one of each. Batteries will vary. 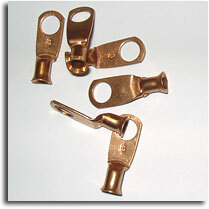 I have used these with wire as small as #14. Strip twice as much wire, twist the exposed wire, fold in half, twist another half turn, insert, crimp with pliers near the opening, solder. Crimping too near the ring end can cause the solder to leak. I have used these with #6 wire, sometimes it fits, sometimes by snipping a couple stands of the stripped wire. Each resistor will dump about 1.4 amps at 12V. 4 resistors on each power N-fet will dump about 5.6A, and the power N-fet will only need a small heat sink. 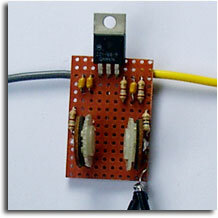 Includes 2 Schottky diodes (1A 20V or similar) for use as flyback diodes. One for each power N-fet. USA ONLY. I can ship to other countries, but it may not be worth it due to additional shipping costs. LED Experimenters Packs - Enough to get started experimenting! Note: Please read the Disclaimer before sending any inquires, orders, payments, etc. I can only process orders after the Disclaimer is completely understood and accepted by the buyer, assembler, user, purchaser, and all of their legal council, inclusive.